Teeth whitening treatment can remove years of dental discoloration to reveal a more youthful, vibrant smile. Many people who wish to improve the appearance of yellowed, discolored teeth make excellent Zoom!® teeth whitening candidates. Schedule a consultation with Redwood City, CA dentist Jean E. Barthman to find out if Zoom!® teeth whitening is right for you. Zoom!® teeth whitening treatment safely and effectively lifts years of dental discoloration and stains from the teeth in as little as one dental visit. The Zoom!® teeth whitening procedure provides excellent results by combining a powerful hydrogen peroxide-based bleaching gel with special dental light to help dissolves surface stains. 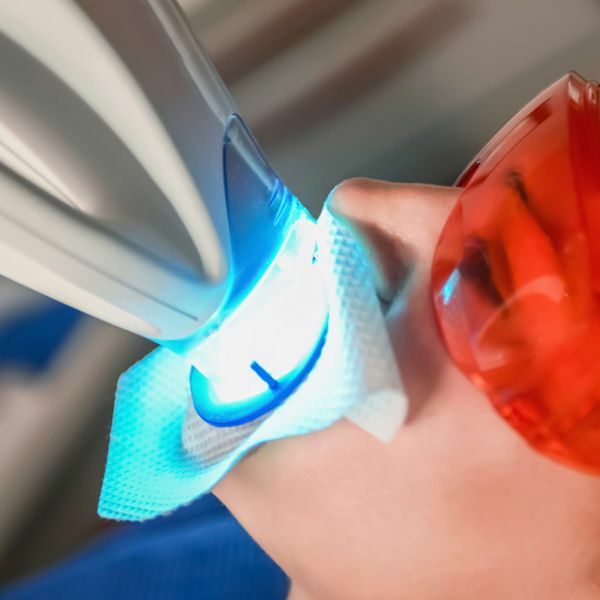 During the Zoom!® teeth whitening procedure, the whitening gel is applied directly to the teeth and the brightening light is applied in a process that takes about an hour from start to finish. Some patients will achieve their desired results with one whitening treatment, while others may require multiple treatments to sufficiently whiten the teeth. Who Is a Good Candidate for Zoom!® Teeth Whitening? Relatively healthy gums and teeth: Any oral health problems should be addressed before undergoing teeth whitening. Extrinsic stains: Extrinsic stains are commonly caused by foods and drinks, as well as aging and tobacco use. Extrinsic stains affect the surface of the teeth, making them easy to treat with teeth whitening. Mild to moderately yellowed or discolored teeth: Those with mild to moderate dental discoloration may benefit from teeth whitening treatment. Unhappy with the appearance of yellowed, stained teeth: Those who are unhappy with the appearance of yellowed teeth may be able to improve the brightness of their smiles with as little as one Zoom!® teeth whitening treatment. Who Is Not a Good Candidate for Zoom!® Teeth Whitening? Pregnant women: Although teeth whitening is safe, it is best to postpone cosmetic dental procedures until after pregnancy. Those with intrinsic stains: Intrinsic stains are deep stains affecting the dentin layer of the teeth. Intrinsic stains may appear as white spots or an overall gray color on one or more teeth. These stains can be caused by such things as trauma, poor oral hygiene, and genetic disorders. Because intrinsic stains are below the surface of the enamel, they often cannot be treated with teeth whitening. Those with untreated oral health problems: Those with untreated oral health problems, like gum disease or tooth decay, will need to obtain treatment for oral health issues before undergoing teeth whitening. Those with front facing dental restorations: Tooth-colored dental restorations do not respond to teeth whitening treatment, which can lead to a noticeable difference between the color of the restoration and the natural teeth when teeth whitening is performed. Those with front facing dental restorations may want to reconsider undergoing teeth whitening unless they are willing to seek replacement of their dental restorations. For more information about Zoom!® teeth whitening, or to find out if you're a candidate, we invite you to schedule a consultation with Dr. Barthman.